One thing we are really blessed with is a zoo a couple miles away! It is one of our FAVORITE places to go as a family and we always love seeing the animals and learning new things about them! Did you know each year on April 8th, National Zoo Lovers Day is celebrated in recognition of the approximately 175 million people that love and visit zoos??!! I LOVE THAT! But don't worry if you missed that fun day celebrating the zoo or don't have a zoo near by. You can bring the zoo to your home for your little one with the NEW Tiny Love Gymini Kick & Play – City Safari! I really LOVE how colorful the safari baby mat is and the responsive electronic pad is so fun for baby to kick and play with! 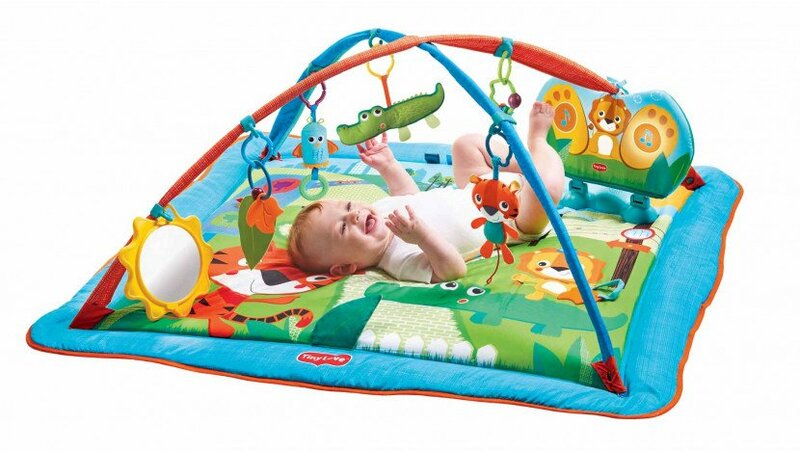 As you know I also love toys that grow with baby so I love that this mat has 3 modes of use: cozy closed borders for newborns, arched play gym and extra large play mat for sitting babies. It will last for a long time and be hours and hours of fun! Plus, it is gender neutral so it makes a great baby gift, especially for parents who don't know the gender of their baby! It is great for encouraging baby to develop their Gross Motor Skills and discover their senses! You can purchase the Gymini Kick & Play for $69.99 from the Tiny Love online store. Tiny Love is generously offering (1) Gymini Kick & Play - City Safari to a lucky winner!